A three year old Afghan girl suffering from a tumour is to receive vital medical treatment following a campaign by Italian photojournalist and EPUK member Kash Gabrielle Torsello. Shabana Ghul suffers from neurofibromatosis, a rare inherited genetic disorder in which tumours develop along nerves, causing severe damage and premature death if left untreated. As part of a pioneering project, Shabana has been flown with her father Janat from Kabul to Rome’s Fatebenefratelli San Pietro hospital where she will be operated on by a team of Western and Afghan surgeons led by Dr Fabio Abenavoli, a specialist in plastic and reconstructive surgery. Shabana’s operation marks the beginning of direct collaborations between Italian and Afghan hospitals, and is the second phase in the Staramasce’ Salento Negroamaro 2007 project, borne from the cooperation between the photojournalist and Afghanistan’s Lecce Province. It is hoped that her operation will be the first in a series of medical exchanges between Afghanistan and Italy, eventually enabling Afghanistan’s own doctors to treat patients with similar conditions. Torsello first met Shabana by chance in 2005 while photographing in Kabul. 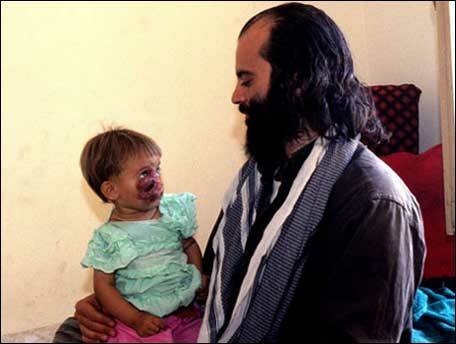 when the girl was aged just nine months old and was already suffering from a severe facial abscess on her face. After travelling to her home town Kair Khana the next day to meet her father, Torsello helped Shabana’s family to meet with a doctor at Avencina Emergency Hospital who finally diagnosed the growth. Shabana was first operated on at Maiwand Hospital in Jada-Kabul, the only hospital in Afghanistan which performs plastic surgery. Torsello, an experienced London-based photojournalist, has photograph on several international projects including his 2003 book The Heart of Kashmir.. While working in Afghanistan October 2006 he and his interpreter were abducted by armed gunmen while traveling between Helmand province and Kandahar. While his interpreter was released almost immediately, Torsello was held for 22 days, and was only released following negotiations by the Italian Foreign Ministry. Since his release, Kash has been working to develop a program of medical and cultural exchanges between Afghanistan and Europe. Following the operation Shabana will rest at the Fondazione Daniela e Paola before flying back to Afghanistan. The Fondazione is a family home for children created in memory of two sisters from Casarano who were killed in a 2005 terrorist attack in Egypt.